The Michigan State Approving Agency (SAA) is located within the Workforce Development Agency of the State of Michigan. 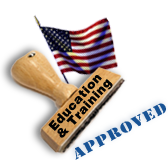 The SAA is responsible for approving applicable facilities to provide training under the GI Bill®. The mission of the Michigan State Approving Agency is to approve education/training facilities and related programs for Veterans and Other Eligible Persons throughout the State of Michigan. These approvals enable the utilization of GI Bill® educational benefits (Chapters 30, 33, 35, 1606, 1607) at Michigan’s educational and training facilities. Michigan has more than 700 approved educational institutions, apprenticeship training, and On-the-Job Training sites which offer educational and training programs to Military Personnel, Veterans, and Other Eligible Persons. Inspecting, evaluating and approving applicable facilities and/or courses of education for Veterans, and Other Eligible Persons throughout the State of Michigan under the provisions of Chapter 36, Title 38, and Title 106, United States Code (USC) and the Code of Federal Regulations (CFR). Evaluate and approve apprenticeship and on-the-job training facilities and/or training programs for Veterans, and Other Eligible Persons throughout the State of Michigan, under the provisions of Chapter 36, Title 38, and Title 106, United States Code (USC) and the Code of Federal Regulations (CFR). Ascertaining whether a school/facility, at all times, complies with the established standards relating to the programs or courses, which have been approved. Approve license, certification, and exam fees offered in the State of Michigan which meets approval standards for Veterans and Other Eligible Persons under the provisions of Chapter 36, Title 38, and Title 106, United States Code (USC) and the Code of Federal Regulations (CFR). Requests for Initial Approval and Revision applications for schools, training facilities, and licensing and certificates can be made directly to MISAA@michigan.gov. Initial approval may involve the approval of one or more programs at a new, previously unapproved institution. It may also involve the approval of a new, previously unapproved program at a currently approved institution. While SAA approval is program specific, many of the approval criteria (e.g., probationary policy, disciplinary policy and grading system, etc.) are institutional in nature, applying to more than one program. At many schools, all or most of the currently offered programs are approved, leading us to use interchangeably the terms “institutional approval” and “program approval.” What we are actually doing is approving programs and the institutional policies that underlie them. Revised approvals (modifications) may involve a change in institutional or program status which may impact on: policy, name, location, accreditation, program design (e.g., length), school ownership, branch campus, or other factors covered in the regulations and requiring SAA review and approval. The revised approval may occur at any time after initial approval and is usually precipitated by either institutional notification to the SAA or as a result of findings during Technical visits or Compliance Surveys. The approval of programs is publication-based. It is dependent upon information in the school’s publications, which the school must certify as true and correct. Since many Institutions of Higher Learning (IHL) and Non-College Degree (NCD) schools issue periodic revisions of their publications which may contain new or revised policies and programs, the SAA must acquire certified copies of these new publications – review, analyze and approve them – and forward them to the VA. This is a form of revised approval of the institution and its programs. Upon approval of the program, the school/employer/sponsor agrees to designate a person(s) who will be the Certifying Official(s). The Certifying Official will be the liaison with the Michigan SAA and the VA. The Certifying Official is the only school/facility representative who may endorse VA certificates for the purpose of GI Bill® educational benefits, and is responsible for keeping the beneficiaries’ training file current. The school/employer/sponsor requests and begins preparing the application materials and required attachments. The Michigan SAA and the school/employer/sponsor will review the application package to determine if approval criteria have been met. Upon completion of the approval process, copies of the approval letter and application materials are sent to the U.S. Department of Veterans Affairs Regional Office (VARO) for approval concurrence. The VA could require additional information prior to their final actions. The VARO will advise the Michigan SAA and school/employer/sponsor of VA concurrence by issuance of VA Form 22-1998. Upon receipt of VA concurrence, the school/employer/sponsor can then advertise that they are approved for the training of Veterans and Other Eligible Persons. Also, after applicable training, the Certifying Official may begin certifying enrollments or hours of training of those eligible beneficiaries GI Bill® educational benefits. Upon approval of the program, the school/employer/sponsor agrees to designate a person(s) who will be the Certifying Official(s). The Certifying Official will be the liaison with the Michigan State Approving Agency. The Certifying Official is the only school/facility representative who may endorse VA forms or web based certifications for the purposes of GI Bill® educational benefits; further, the Certifying Official is responsible for keeping the beneficiaries’ training file current. Changes of school accreditation, ownership, branches, academic offerings, or licensing. Changes to policies or content of catalog or school bulletin. Changes in modality of course instruction. Changes to the Journeyman/finish wage scale. Changes in address, phone number, etc. Additions or deletions of occupational trades. "GI Bill®” is a registered trademark of the U.S. Department of Veterans Affairs (VA). For more information about GI Bill® approval for your facility, contact the Michigan State Approving Agency at MISAA@Michigan.gov.